This is Rachelle. She was my instant friend the minute I started chatting with her on the phone for the very first time. You see, I’ve only ever known one other Rachelle and she is one of my best friends and she always goes nuts when people pronounce her name like Rachel because that is not her name. So, THIS gorgeous new friend Rachelle and I laughed over that when I pronounced her name correctly right away. We laughed, we dished, we teared up, all in our first phone call and I fell immediately in love with her as I know you are about to do too. And this is Matt, Rachelle’s husband. Fur stoles look good on him. They are BFFs and the absolute perfect match for each other in every way. So, you get it. These two are FUN. They are hilarious. They are 2 of the nicest, most generous people I have ever met. And they are foodies, so we speak the same language. Oh, and what’s more they LOVE COLOR, (happy dance!) 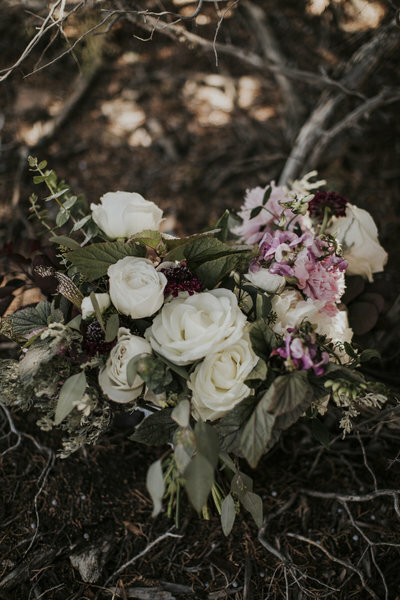 and this was the color palette they chose for their intimate October wedding at Pronghorn Resort, full of autumnal hues like apricot, burgundy, and oranges, with a touch of blue for Matt, who happens to love blue. These two long time loves wanted to give their closest family and friends a memorable, one of a kind experience for their wedding. They kept their guest list abbreviated so that they could enjoy every single one of their guests as much as possible and they focused their budget on food, entertainment, decor, and FLOWERS. 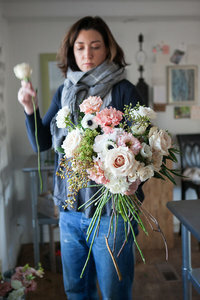 These two are into farm-to-table food, so I reflected that in my floral choices and focused on farm-to-vase flowers, keeping my ingredient list as local and seasonal as possible so as to keep their wedding aesthetic and themes cohesive. I chose a variety of local dahlias and California-grown tillandsia as our focal elements, supported by a cast of roses, seed pods, straw flower, pheasant feathers, vines, pepperberry, nandina, and chocolate cosmos to round out my recipes. It all became a regal, visual feast, with just the right touch of whimsy and fun mixed in. Rachelle and Matt BOTH wanted unexpected elements as part of their wedding day looks. Matt didn’t want a traditional boutonniere, but opted for a floral accented pocket square. Rachelle wanted me to surprise her with floral accessories, so we created hair flowers to compliment her hair style and a custom floral sash to accent her waistline. Here I am fitting it onto her dress and hand finishing the tulle sash right before their first look. We joked that we had created the floral trifecta for her. Bridal bouquet, hair flowers, and a floral sash. BAM! As you see, humor and fun run in Rachelle’s family. Her sisters were just as awesome and gorgeous as she is. Corsage cuffs honored some of the most special women in their lives. A boutonniere for their late father, which we placed on his place setting in memory. 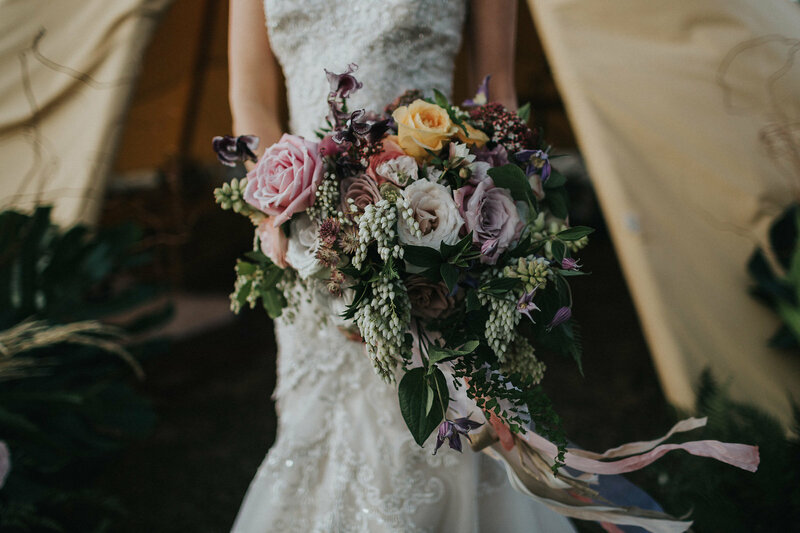 Their ceremony was held inside Pronghorn’s Clubhouse in front of its’ iconic fireplace, which was full of textural, seasonal greenery, vines, florals, and feathers. Their aisle lined with an eclectic mix of lanterns, candles, and blooms. And now for their unbelievable dinner party, which was held in the Chanterelle dining room, dressed in rich brocades, sumptuous linens, and lush luxurious florals. The U-shaped king’s table gave the room a regal, yet very intimate feel. Can you all see why I can’t get enough of these two? They have my heart.